Gold Fields of Siam: Collection of Digitized Maps and Diaries of Phra Sarasasana Balakhandh (Colonel G.E. Gerini) is an innovation-driven, multidisciplinary, pilot project by Faculty of Archaeology and GISSAD to test the recommendations of UNESCO on protecting documentary heritage and providing universal access to it. This digital publication represents our innovative approach, designed to integrate the fields of preservation and conservation of archive, digital technologies, and tourism, with a hope that it may become a driving force of a creative economy in Thailand. G.E.Gerini’s three important geographic § biographical routes, 'Rising in the Occident', 'Shining in Siam and the Orient', 'Marching on in the Occident' during his lifetime from 1860 to 1913, his authentic historic itineraries of 'Bāng Tap’hān Gold Fields of Siam' as recorded in G.E. Gerini's diaries in 1885, 1886 and 1888-1889 have been precisely sketched and presented, together with the properties of documentary heritage of Bāng Tap’hān and Gold Fields of Siam from the the point of view of G.E Gerini, the flâneur. The digitized manuscripts and the short videos, specially-created, based on Gerini’s diary entries, can be viewed by scanning our beautiful multi-coloured QR codes. 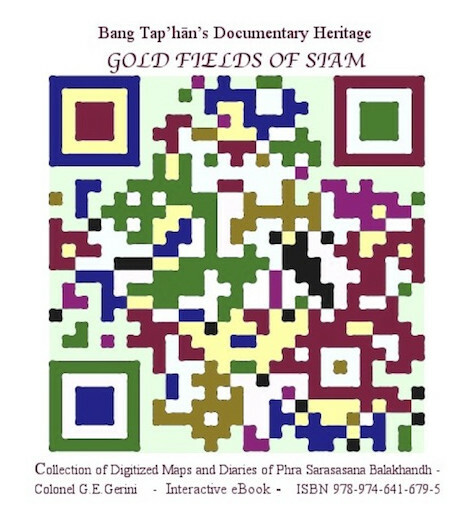 This digital book provides the best inspiration for tourists to travel to Bāng Tap’hān Gold Fields of Siam' following his footstep. It is also a creative digital product for people to apply to steer the value-based and innovation-driven economy in their community.